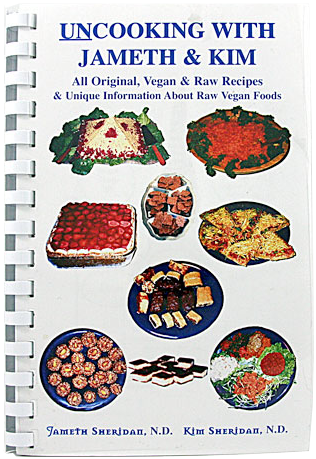 A (HUMAN) raw, vegan recipe & nutritional information book …including gourmet delights! Most people think that a raw food diet consists of “rabbit food” and involves eating nothing but salads and fresh fruits all day long… This is absolutely false! Learn little known facts about health and raw foods, much based on Jameth and Kim’s own research. Their approach to health and raw foods is very balanced and scientific, and their book contains much information found nowhere else. Learn about why to eat raw foods, enzymes, lifeforce, sugar and fat in raw foods, carbohydrate/protein/fat ratios with raw foods, when and how to use nuts and seeds (and when and how not to), sprouting, leukocytosis (and how to avoid it while still eating some cooked food), electromagnetic radiation, healthful seasonings, cleansing reactions/healing crises and how to maximize their effects, why raw food does not have to be cold food, nutritional supplementation, which raw foods and raw meals are LESS healthful than cooked ones, plus more. Learn how to make such tempting entrees as no-meat loaf, carrot stuffing, mock spaghetti, veggie burgers, vegan sushi nori rolls, soups, dehydrator crackers, instant dips, dressings, and more! Even raw/dairyless pizza! Includes valuable tips on sprouting. Say goodbye to that oven, and hello to good health…..and great taste!!! These recipes may change the way you think about raw vegetables!!! To complete your healthful kitchen know-how, learn how to make incredibly tasty snacks, drinks and desserts such as nut milks, dairyless milkshakes, super smoothies, puddings, non-dairy ice creams and ice cream sandwiches, pies, un-cookies, and more! Even raw candy bars! Enjoy guilt-free holidays with such recipes as nut-nog, pumpkin pie, and apple pie. Treat yourself and convert your friends with these mouthwatering, healthful creations. Everything is raw, gourmet and delicious! Now this is living!!! Learn some extremely healthful raw and cooked combination meals that do not cause leukocytosis and are healthier than many raw food meals that people commonly eat. Also includes resources for high quality “raw” materials. Most people want variety and don’t want to give up gourmet delights . . . and you don’t have to! That’s where we come in! We have researched multiple facets of health (and lived a healthful lifestyle) for over 25 years we have experienced remarkable results in the way we feel and how we experience life. Our creation of these recipes is our way of keeping our own diet fun and gourmet without compromising our health! These recipes are available in our book, Uncooking With Jameth & Kim. It is our intention that these recipes will provide you with a variety of options and ideas for getting the benefits of more raw foods in your diet every day. Although this book contains almost entirely raw food recipes, and we fully support consuming a balanced diet of mostly or totally raw foods (if done properly), we do not feel you should put pressure on yourself to eat 100% raw foods. The reason we mention this is because many raw fooders (ourselves included, in the past) become very judgmental of themselves and often others if they are not 100% RAW. We recommend a whole foods, vegan, organic diet with as much emphasis on raw foods as possible. May you enjoy good food and good health!